Enjoy! School resumes on Monday, April 29, 2019. Click the headline to submit online if you haven't done so already. Online submission extended to April 25, 2019. The World Language Department congratulates our Latin students and their exceptional teachers, Ms. Arcidiacono and Mr. Carli. Click the headline to view the students' names and their awards. Congratulations to the National Honor Society (NHS) senior students who were inducted into the National Honor Society on Thursday, April 11, 2019. Watch the latest shows here. The Boys Varsity Lacrosse team defeated Susan Wagner High School on Monday, April 15, 2019, by a 5-4 score. The team plays on Wednesday, April 17th, at 4 o'clock vs. Hunter High School on Field 75 at Randall's Island. Click the headline for further information about the team and its win against Susan Wagner..
Congratulations to Lauren Kim and Jacqueline Song for having an exceptional finish at the PSAL Girls Fencing Invitational on Sunday April 7, 2019. Junior, Lauren Kim took gold and Sophomore Jacqueline Song took Bronze in women's foil. Click the headline for further information. Joanna will attend Community Board 11 Day at Yankee Stadium for the on-field ceremony to receive the award, which is scheduled for Tuesday, May 14, 2019. Congratulations Joanna. This includes PSAL sports and detention. We are getting ready for the Bronx Science College Fair for juniors and sophomores, and their parents/guardians. On Saturday night, June 8th, 2019, the junior class will celebrate the prom at the chic Flatiron District nightclub, Slate NY. Located at 54 W. 21stSt. NY, NY 10010 in the heart of the Flatiron District, Slate features chic design elements and a incredible gaming arcade with all the amenities you can imagine. Click the headline for all the details. Click the headline for further information and to apply. 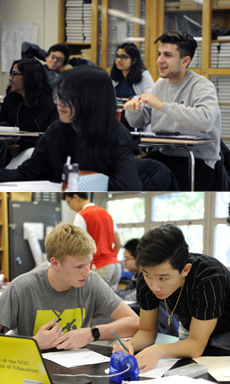 Together with the Bronx Science Alumni Foundation, Bronx Science is pleased to offer four summer institutes to rising sophomores, juniors and seniors unless otherwise stated. All programs begin on July 1, 2019 and conclude on August 2, 2019. Click the headline for more information and to apply. The Brunner Awards were funded and conceived by alumnus Charles Brunner ’56. The Brunner Awards is a financial stipend awarded to students who would like to pursue a project or experience to further their personal growth or help in their education. Click the headline for details and to apply. Starting school year 2018-2019, Bronx Science now has an annualized school year. All one year grades will continue throughout the school year. You will only see a Term 1 for 2018-2019. Click the headline for instructions on how to switch between past terms. The Health Resource room has many free resources (completely confidential) available to all students. Ms. Konstantakakos will be available Monday - Friday period 3 in room 040. Ms. O'Rourke will be available Monday - Friday period 4 in room 312. Mr. Dahlem will be available Monday - Friday period 6 in room 049. Fee waivers will be given out on Mondays, Wednesdays and Fridays. Times: 9:30 - 12:15 and 1:15 - 2:30. Click the headline for important details. Click the headline for information on how to obtain working papers at Bronx Science. Students can also stop by their local high school to obtain working papers. Click the headline for further information. Click the headline to view the 2018-2019 school year in 10 languages. Need Your Bronx Science Email Password Reset? Click the headline for information about the S.O. Lost & Found. Students who have locker problems should complete the form below. Click here to complete the Locker Form. You must be logged into your Bronx Science email account in order to access the online form.